CALGARY, Aug. 8, 2018 /CNW/ - Surge Energy Inc. ("Surge" or the "Company") (TSX: SGY) announces its operating and financial results for the quarter ended June 30, 2018. Based on excellent development drilling results in all three of Surge's core areas, together with successful waterflood results at Shaunavon and Eyehill, the Company's Q2/18 production significantly exceeded management's budgeted expectations. In Q2/18 Surge's production averaged 17,072 boepd (81 percent oil and liquids) - which is very close to the Company's 2018 production exit rate guidance of 17,175 boepd. This exciting operational result was 10 percent above Surge's budgeted expectations, and was accomplished during spring break-up where the Company had a reduced drilling program. Surge has now revised upward the Company's production guidance five times in the last 23 months – two times organically, and three times relating to accretive Sparky core area acquisitions. In the last eight financial quarters Surge has now grown the Company's production per share by over 34 percent. As a result of the Company's consistent quarterly production per share growth, combined with higher oil prices, Surge's adjusted funds flow per share in Q2/18 increased by 38 percent as compared to Q1/18. Surge's budget for adjusted funds flow in Q2/18 was $28.8 million; and the Company's actual adjusted funds flow for Q2/18 came in 34 percent higher than budget at $38.6 million. 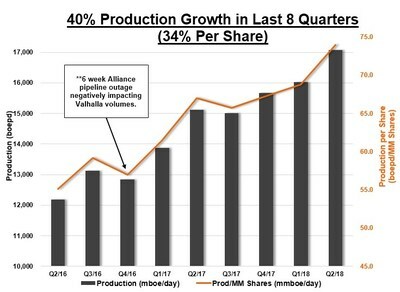 The Company's current production exceeds Surge's 2018 exit production guidance estimate of 17,175 boepd; with 60 percent of the Company's 2018 drilling program remaining. Surge's Q2/18 quarterly production of 17,072 boepd increased by 13 percent over Q2/17 production of 15,125 boepd (10 percent per share). Surge's Q2/18 quarterly production increased by seven percent over Q1/18 production of 16,027 boepd (eight percent per share). Adjusted funds flow in Q2/18 was $38.6 million, an increase of 43 percent as compared to Q2/17 at $27.0 million. Adjusted funds flow per share in Q2/18 was $0.167, an increase of 39 percent over Q2/17 at $0.120 per share. Adjusted funds flow of $38.6 million in Q2/18 increased 37 percent as compared to Q1/18 at $28.2 million. Adjusted funds flow per share in Q2/18 of $0.167 increased 38 percent over Q1/18 at $0.121 per share. Crude oil and liquids production increased by 14 percent - from 12,200 barrels per day in Q2/17 to 13,899 barrels per day in Q2 2018. The Company's unhedged operating netback increased by over 32 percent, to $31.92 per boe in Q2/18, from $24.12 per boe in Q2/17. The Company generated over $9.5 million of free adjusted funds flow in the quarter, which drove an all-in payout ratio of 75 percent. Surge maintained a simple dividend payout ratio of less than 15 percent in Q2/18. Maintained a net debt to adjusted funds flow ratio of 1.78 times. In Q2/18, Surge finalized a large increase in the Company's bank line to $350 million from $305 million. This significant increase provides the Company with more than $100 million of pro-forma liquidity on its bank line as at June 30, 2018. On May 31, 2018, Surge closed the acquisition of high netback, waterflooded, crude oil producing assets in the Company's core Sparky area of Central Alberta for a purchase price of $28.4 million. Production in Surge's Sparky core area has now increased 145 percent over the last two years, from 2,850 boepd to over 7,000 boepd (85 percent oil) today. Management uses adjusted funds flow (cash flow from operating activities before changes in non-cash working capital, decommissioning expenditures, transaction costs and cash settled stock-based compensation) to analyze operating performance and leverage. Adjusted funds as presented does not have any standardized meaning prescribed by IFRS and, therefore, may not be comparable with the calculation of similar measures for other entities. Please see capital expenditures discussion throughout this press release. The Company defines net debt as outstanding bank debt plus or minus working capital, however, excluding the fair value of financial contracts and other current obligations. The Company views this change calculation as not meaningful, or "nm". Based on better than anticipated drilling and waterflood results in the Company's three core areas at Sparky, Valhalla, and Shaunavon, Surge's Q2/18 average production of 17,072 boepd significantly exceeded management's budget expectations, and all street estimates. Surge's current production exceeds the Company's 2018 production exit rate guidance estimate of 17,175 boepd (82 percent oil and liquids); with 60 percent of Surge's 2018 drilling program remaining. In the context of today's rising crude oil price business environment, Surge management is excited to remind the Company's shareholders of the many total rate of return components, and the substantial tax benefits, associated with Surge's multi-faceted, low risk business model. a compelling capital gain opportunity (Surge's independent Sproule year end 2P before tax NAV is $6.06 per share). 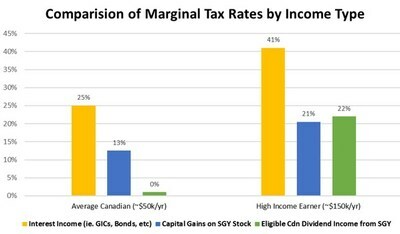 *Note: For those shareholders in the highest marginal tax bracket in Alberta; capital gains and eligible dividends are approximately 50% and 34% more tax-effective, respectively, as compared to interest income. Surge is able to provide the very tax-efficient returns set forth above as a result of the Company's substantial, high graded, tax pool base (currently estimated to be in excess of CAD $1.0 billion), which provides an internally estimated tax horizon of more than five years, based on Sproule's new June 30, 2018 crude oil price deck (i.e. no significant cash tax payments anticipated). The above comparisons are based on Company internal estimates and are illustrative for tax purposes. Each investor has their own risk/reward tolerance, income tax criteria, and investment requirements. Please consult your investment and/or tax advisor. In the current environment of rising taxes, Surge is pleased to be able to deliver the above, "after tax", efficient returns to its shareholders. As discussed above, Surge exceeded management's budgeted production expectations for Q2/18 by 10 percent. Production in Q2/18 averaged 17,072 boepd (81 percent oil and liquids), compared to the Company's internal budget of 15,579 boepd, and analyst consensus on the street of 16,250 boepd. During the spring break-up quarter in Q2/18, Surge implemented a reduced drilling program, with all-in capital expenditures of $23.3 million. Surge's Q2/18 program included the drilling of 5 wells (5 net), together with associated capex for infrastructure, land and seismic. The Company experienced a 100 percent success rate for the Q2/18 drilling program. In early June, the Company began its 2H/18 drilling program where Surge plans to drill and complete a total of 25 wells in its three core areas, including 16 Sparky area wells, 6 Shaunavon wells, and 3 Valhalla wells. As part of the Sparky core area program, Surge will be drilling four, 100 percent working interest wells at the Company's exciting, new, 80 million net barrel internally estimated original oil in place ("OOIP"2), Sparky discovery at Betty Lake. The Company internally estimates more than 35 follow-up locations at Betty Lake. In addition, Surge will also be drilling 3 more wells at its large 75 million net barrel internally estimated OOIP, Sparky pool at Provost, to follow up on Surge's last 5 Provost wells - which are averaging 165 percent of type curve. The Company internally estimates more than 40 follow-up locations at Provost. Management attributes the Company's continued quarterly operational outperformance to be a direct result of applying growth capital to Surge's high quality, operated, large OOIP, light and medium gravity crude oil, sandstone reservoirs at the Company's three core areas of Sparky, Valhalla, and Shaunavon. Management's stated goal is to be the best positioned, top performing, light/medium gravity crude oil growth and dividend paying public company in our peer group in Canada. Surge issued no treasury shares during the protracted downturn for world crude oil prices. 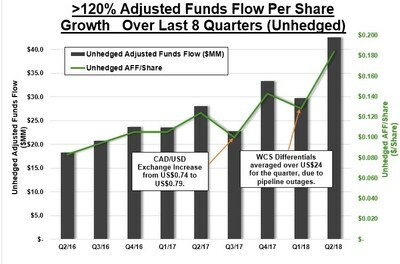 Now the Company's significant production per share growth over the last eight financial quarters, combined with higher oil prices, is driving large increases in the Company's unhedged adjusted funds flow, and unhedged adjusted funds flow per share (please refer to the graph above). 2 Original Oil in Place (OOIP) is the equivalent to Discovered Petroleum Initially In Place (DPIIP) for the purposes of this press release. upwardly revising production estimates five times (two times organically, and three times relating to core area Sparky acquisitions). Surge focuses on sustainability, balance sheet management, and cost controls to deliver returns to Surge shareholders. The Company continues to grow its production base and 11 year drilling location inventory in its three core areas of Sparky, Shaunavon, and Valhalla - in accordance with management's strategic Five Year Business Plan - through low risk development drilling results, waterfloods, and strategic, high quality, large OOIP, core area acquisitions. This press release contains forward-looking statements. The use of any of the words "anticipate", "continue", "estimate", "expect", "may", "will", "project", "should", "believe" and similar expressions are intended to identify forward-looking statements. These statements involve known and unknown risks, uncertainties and other factors that may cause actual results or events to differ materially from those anticipated in such forward-looking statements. More particularly, this press release contains statements concerning: management's expectations with respect to the development of its asset base; production volumes; drilling activities, inventories and locations, and the associated risks; Surge's capital expenditure program, including drilling and development plans and enhanced recovery projects and the timing and results to be expected thereof; expectations with respect to the Company's ability to operate and succeed in the current commodity price environment; changes to the current commodity price environment; the Company's declared focus and primary goals, including the Five-Year Business Model; 2018 exit production and production per share growth; Surge's dividend; simple payout ratio; operating and corporate netbacks; characteristics of certain wells or assets; management's estimates and expectations regarding capital expenditures and operating costs, growth opportunities and strategies, the underlying value of Surge's common shares, estimated reserves and estimated reserve and resources; the Company's 2018 guidance; sustainability of Surge's current results, production and operations; the benefits of Surge's business model and the risk associated therewith; Surge's estimated tax horizon and tax pool base; the rate of return anticipated for Surge shareholders; the availability of Surge's bank line to fund provide the Company with sufficient liquidity and financial flexibility; anticipated commodity prices; and management's expectations regarding debt levels. The guidance for 2018 set forth in this press release may be considered to be future-oriented financial information or a financial outlook for the purposes of applicable Canadian securities laws. Financial outlook and future-oriented financial information contained in this press release are based on assumptions about future events based on management's assessment of the relevant information currently available. The future-oriented financial information and financial outlooks contained in this press release have been approved by management as of the date of this press release. Readers are cautioned that any such financial outlook and future-oriented financial information contained herein should not be used for purposes other than those for which it is disclosed herein. The forward-looking statements are based on certain key expectations and assumptions made by Surge, including expectations and assumptions concerning the performance of existing wells and success obtained in drilling new wells, anticipated expenses, adjusted funds flow and capital expenditures, the application of regulatory and royalty regimes, prevailing commodity prices and economic conditions, development and completion activities, the performance of new wells, the successful implementation of waterflood programs, the availability of and performance of facilities and pipelines, the geological characteristics of Surge's properties, the successful application of drilling, completion and seismic technology, the availability of capital, the determination of decommissioning liabilities, prevailing weather conditions, exchange rates, licensing requirements, the impact of completed facilities on operating costs, the availability and cost of capital, labour and services, the credit worthiness of industry partners and the impact of transactions on Surge's bank line. Although Surge believes that the expectations and assumptions on which the forward-looking statements are based are reasonable, undue reliance should not be placed on the forward-looking statements because Surge can give no assurance that they will prove to be correct. Since forward-looking statements address future events and conditions, by their very nature they involve inherent risks and uncertainties. Actual results could differ materially from those currently anticipated due to a number of factors and risks. These include, but are not limited to, risks associated with the oil and gas industry in general (e.g., operational risks in development, exploration and production; delays or changes in plans with respect to exploration or development projects or capital expenditures; the uncertainty of reserve estimates; the uncertainty of estimates and projections relating to production, costs and expenses, and health, safety and environmental risks), commodity price and exchange rate fluctuations and constraint in the availability of services, adverse weather or break-up conditions, uncertainties resulting from potential delays or changes in plans with respect to exploration or development projects or capital expenditures and failure to obtain the continued support of the lenders under Surge's current bank line. Certain of these risks are set out in more detail in Surge's Annual Information Form dated March 15, 2018 and in Surge's MD&A for the period ended June 30, 2018, both of which have been filed on SEDAR and can be accessed at www.sedar.com. Boe means barrel of oil equivalent on the basis of 1 boe to 6,000 cubic feet of natural gas. Boe may be misleading, particularly if used in isolation. A boe conversion ratio of 1 boe for 6,000 cubic feet of natural gas is based on an energy equivalency conversion method primarily applicable at the burner tip and does not represent a value equivalency at the wellhead. Boe/d and boepd means barrel of oil equivalent per day. Original Oil in Place ("OOIP") is the equivalent to Discovered Petroleum Initially In Place ("DPIIP") for the purposes of this press release. DPIIP is defined as quantity of hydrocarbons that are estimated to be in place within a known accumulation. There is no certainty that it will be commercially viable to produce any portion of the resources. "Internally estimated" and similar terms means an estimate that is derived by Surge's internal APEGA certified Engineers, and Geologists and prepared in accordance with National Instrument 51-101 - Standards of Disclosure for Oil and Gas Activities. All internal estimates contained in this new release have been prepared effective as of June 30, 2018. IRR means Internal Rate of Return and is the discount rate required for the net Present Value to equal zero. PIR means Profit to Investment Ratio and is equal to the present value of future adjusted funds flow divided by the investment capital (a value lower than 1.0 would indicate that the projects Present Value is less than the initial investment). This press release discloses drilling locations that are booked locations as well as unbooked locations. Proved locations and probable locations, which are sometimes collectively referred to as "booked locations", are derived from the independent engineering evaluation of the oil, natural gas liquids and natural gas reserves attributable to the Company prepared by Sproule Associates Limited effective December 31, 2017 and dated February 9, 2018 (the "Sproule Report") and account for drilling locations that have associated proved or probable reserves, as applicable. Unbooked locations are internal estimates based on the Company's prospective acreage and an assumption as to the number of wells that can be drilled based on industry practice and internal review. Unbooked locations do not have attributed reserves or resources. Of the more than 700 gross (675 net) drilling locations identified herein 420 gross (404 net) are unbooked locations. Of the 292 gross (276 net) booked locations identified herein 228 gross (215 net) are proved locations and 64 gross (61.2 net) are probable locations as of the Sproule Report. Unbooked locations have specifically been identified by management as an estimation of our multi-year drilling activities based on evaluation of applicable geologic, seismic, engineering, production and reserves data on prospective acreage and geologic formations. The drilling locations on which we actually drill wells will ultimately depend upon the availability of capital, regulatory approvals, seasonal restrictions, oil and natural gas prices, costs, actual drilling results and other factors. This press release contains the terms "adjusted funds flow", "adjusted funds flow per share", "free adjusted funds flow", "free adjusted funds flow yield", "net debt", and "net debt to adjusted funds flow ratio", which do not have a standardized meaning prescribed by International Financial Reporting Standards ("IFRS") and therefore may not be comparable with the calculation of similar measures by other companies. Management calculates adjusted funds flow as cash flow from operating activities before changes in non-cash working capital, decommissioning expenditures, transaction and other costs and cash settled stock-based compensation. Adjusted funds flow per share is calculated by dividing adjusted funds flow by the weighted average basic shares outstanding during the period. Management uses adjusted funds flow and adjusted funds flow per share to analyze operating performance and leverage. Management believes that adjusted funds flow and adjusted funds flow per share are useful supplemental measures as they provide an indication of the results generated by the Company's principal business activities before the consideration of how those activities are financed or how the results are taxed. Management defines net debt as outstanding bank debt and the liability component of the convertible debentures plus or minus working capital, however, excluding the fair value of financial contracts and other current obligations. Management uses net debt to adjusted funds flow to analyze leverage and capital structure. Free adjusted funds flow yield is calculated using annualized adjusted funds flow less sustaining capital investment divided by adjusted funds flow. Additional information relating to these non-IFRS measures can be found in the Company's most recent management's discussion and analysis MD&A, which may be accessed through the SEDAR website (www.sedar.com). This news release contains metrics commonly used in the oil and natural gas industry, such as "operating netback", "corporate netback", "FD&A costs", "recycle ratio", "simple dividend payout ratio", "all-in payout ratio" and "NAV" (Net Asset Value). These terms do not have a standardized meaning and may not be comparable to similar measures presented by other companies, and therefore should not be used to make such comparisons. Operating netback denotes total sales less royalty expenses, and operating and transportation costs calculated on a per boe basis. Corporate netback denotes operating netback less general and administrative, interest and financing expense, exploration expense plus interest income on a per boe basis. Surge considers corporate netback as an important measure to evaluate its overall corporate performance. FD&A costs are used as a measure of capital efficiency. FD&A cost has been calculated based on exploration and development capital and acquisition capital spent in the applicable period (including changes in future development capital for that period) divided by the change in reserves for that period including revisions for that same period. Surge provides FD&A costs that incorporate all acquisitions and exclude the reserve, capital, and future development capital impact of dispositions during the year. The foregoing calculation is based on working interest reserves. Recycle ratio is a measure for evaluating the effectiveness of a company's reinvestment program and the efficiency of capital investment. It accomplishes this by comparing the operating netback per boe to that year's reserve FD&A cost per boe. Simple dividend payout ratio is calculated on a percentage basis as dividends declared divided by adjusted funds flow and all-in payout ratio is calculated on a percentage basis as dividends declared plus capital expenditures divided by adjusted funds flow. Simple and all-in payout ratios are used by management to monitor the dividend policy and the amount of adjusted funds flow retained by the Company for capital reinvestment. Net Asset Value ("NAV") is a calculation of per share value derived from the reserves value given by the Sproule Report, the internally estimated undeveloped land value, the internally estimated value of the Companies seismic database and the net debt of the Company.